When Will the Israeli Left Accept the Occupation Started in 1948, Not 1967? Only when the Israeli Left accepts that the occupation began in 1948 — and remains an open wound for Palestinians — can Arabs and Jews truly refuse to be enemies. One of the negative characteristics of the Israeli “Left” is how it terms the military rule over the West Bank and Gaza “The Occupation.” Part of the Left even accuses Palestinians who claim there is no difference between Petah Tikva and Ariel of being like the Right, because “that’s what the Israeli Right claims.” For most Palestinians, however, this exaggerated and Orwellian talk of “The Occupation” blurs Israel’s real shame, and the skeleton buried deep in the closet: The brutal and criminal occupation of 1948. Ethnic cleansing and massive land expropriation, and then settlement of that land, are the mother of all disgraces — even if Israelis refuse to recognize it as such in public, and even if they try very hard to ignore what most Arabs are saying. Israelis’ designation of the ’67 occupation as “The Occupation” is intended, among other things, to either obscure or prevent any engagement with the Nakba. As such, most of Israel’s pseudo-Left is actually composed of Nakba deniers. One of the most worn-out claims used to avoid referring to the crimes of ’48 as an “occupation” is that the Nakba, or the “War of Independence” to use the laundered Zionist expression, was necessary for the national project of establishing a state for the Jewish people following World War II. Another claim, put forward mostly by the Israeli Right, is that Palestinians refused the 1947 UN Partition Plan. This claim has always seemed to me to be void of any foundation or basic logic, and is therefore not worth addressing. Let’s see those who wave this claim around agree to distribute their homes and land to people who have arrived from overseas to dispossess them, and then we can talk about it. The argument that it was necessary to establish a state at the expense of the native population, while justifying it because of the persecution experienced by the occupiers, is pathetic at best. Many good people have already spoken about Zionism’s cynical exploitation of the memory of victims of the Holocaust. But to the ears of Palestinians, these self-justifications along with exaggerated talk of the “The Occupation,” as if there was no other disaster and open wound, sounds more than just pathetic. These statements are intended to blur Israelis’ responsibility for those bloody events. It’s important to bleeding-heart Zionist left-wingers that Arabs and Jews don’t need to be enemies, but less important to listen to Palestinians and understand how traumatic ’48 still is — and how much impact it still has, even for the third generation after the Nakba. It’s not just the diaspora of millions of refugees from the Nakba, most of them living in substandard conditions in camps. It’s also the lack of recognition of the greatest injustice ever done to the Palestinian people. When you don’t recognize your direct responsibility for the catastrophe of another, how can you expect them to live with you in peace or believe in your coexistence slogans? Far too many Israelis, seeking to exempt themselves from Palestinian claims that the lack of recognition over ’48 remains an open wound, feel at ease preaching to Palestinians that they should “let go of the past.” And this is coming from the people who claim to be returning to the land of their ancestors from thousands of years ago. The hypocrisy is boundless. Ignoring and forgetting the past is another negative feature of the “Zionist Left.” Israelis constantly make use of their biblical right to Palestine and continually remind the world of their past persecution — so it’s precisely the leftists among them whom you would have expected to understand Palestinians’ insistence on remembering the crimes of the past. Especially when those same persecuted people are the ones who caused these injustices. 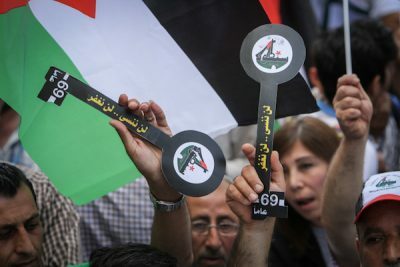 The Nakba will never disappear from the Palestinian discourse as long as no solution to the distress of Palestinians is found, because it is still ongoing and its implications are still being felt. Arabs are still being kicked out of their homes in order to settle Israelis, and not just over the Green Line (see, for example, Umm al-Hiran, and how mixed cities are being Judaized). The sad truth is that recognizing the Nakba necessitates recognizing the original occupation of 1948, which Israelis are scared to confront. You can shout peace slogans until the cows come home, but as long as you ignore the rights of the refugees of 1948 to return to their land at the expense of the settlers in Ein Hod, for example, those words are meaningless. Do you want to engage with Palestinians as equals? Do you want to insist that you refuse to see them as enemies? Do you want to strengthen real leftist values? Then start repeating: The occupation is 69 years old, not 50. When more Israelis come around to this line of thinking and stop denying the Nakba, perhaps then more and more Palestinians will begin refusing to see them as enemies. This article was originally published in Hebrew on Local Call.